New investigation records were released today regarding Tiger Woods's Escalade crash, and there's more than enough fodder in there for conspiracy theorists. 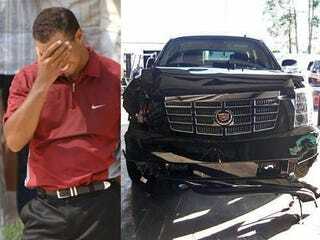 •The Florida Highway Patrol attempted to get Woods's medical records from the hospital the day after the crash. They were told that the records department was closed, since it was Friday afternoon. The next Monday they again attempted to locate the records, and were initially told the hospital's computerized filing system was not working. They were then told that the hospital would not hand over the records without a warrant, which was never issued. •Police requested video footage from the security cameras at Woods's home, but his lawyer repeatedly told them he could not figure out how to access the video. No footage was ever handed over. •The night of the crash, Nordegren showed responding EMTs two bottle of Vicodin that she said Woods had taken earlier in the day. •After the crash, Nordegren drove from the house to the scene of the accident in a golf cart, even though it was only 150 feet away. When troopers asked her to answer questions about the crash, she said she would not without her husband present, according to the report. She asked them to return the following afternoon. Then she simply walked away down a hallway, leaving the troopers standing, by themselves in the mansion, according to the report. If this is the extent of the public records, we're still left with more questions than answers. But unless Nordegren writes a tell-all book (not an impossibility somewhere down the line), this is as complete a picture of that lost weekend as we're going to get.